Degil is a Bosmer commoner who is a devout worshipper of the Daedric prince Namira, and can be found with her fellow worshippers Blanche Mastien and Hjolfrodi the Harrier at Namira's Shrine. 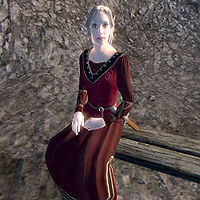 She has a similar schedule to that of most Daedric worshippers, in the sense that she will never leave the shrine, dedicating day and night to worship of her prince. She will mainly sit on one of the benches, but will occasionally get up and wander around. She wears a burgundy linen shirt with burgundy linens and a pair of pigskin shoes. She is armed with an iron dagger and carries a small amount of gold. If you talk to her before Namira's quest is started, Degil will simply tell you to "Talk to Hjolfrodi. I can't help you." She's referring to Hjolfrodi the Harrier who knows how unattractive you must be to get Namira's attention.